Holy cats was the interweb afire with what was announced at the World Wide Developers Conference (WWDC). 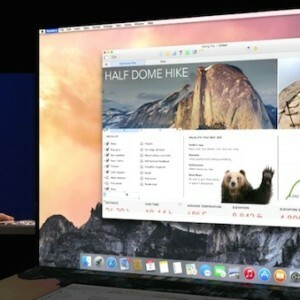 Apple announced a new desktop operating system (OS X Yosemite) and a new mobile OS (iOS 8) – both to be released this fall. Both are major redesigns from previous version with lots of new features that had everyone talking. Yosemite’s newness includes: continuity, so you can share files between your mac and your iOS devices (and you can make phone calls on a Mac via your iPhone); an updated look; a facelifted Notification Center (yes, I’ve decided that’s a word); a way-improved Spotlight that will include not only your computer, but also external sources like Wikipedia, Yelp, and others, plus; iCloud Drive is taking on Dropbox with a service that syncs documents across Macs, iOS devices, and Windows. iOS 8 will have: an interactive notification center you can use without leaving the current open app; predictive typing that makes suggestions based on who you’re talking to AND you’ll be able to install third-party keyboard apps (Swype! ); Messages will let you name conversation threads, remove people from group conversations, and will also have a “Do Not Disturb” feature. Apple also introduced HealtKit, an application programming interface for gathering health information, including from Nike and Fitbit. And, if that wasn’t enough, Siri will get hand-free – you’ll be able to talk to her by saying, “Hey, Siri”. The world-famous designer Diane Von Furstenberg paired with Google to create five new Google Glass frames and eight new shades. The new offerings will be available starting on June 23rd and it’s the first designer offering from Google Glass, although more are on the horizon from Ray-Ban, Oakley, and Luxottica. Of course, the fashionable offerings don’t come cheap—they’re $1,620 instead of the usual $1,500. Ahead of next week’s Xbox One’s electronic entertainment expo (E3), Xbox announced 45 new entertainment app “experiences” are coming to Xbox and Xbox 360. Among these are optimized-for-TV Twitter, Vine, HBO GO, ShowTime Anytime, Comedy Central, and Major League Gaming. You can click here to read a full list of the app experiences, and I’m sure there will be plenty of new info next week after Xbox E3. Microsoft admitted to developers they can expect up to 10 percent more GPU performance on the Kinect-less Xbox One—which is interesting because Microsoft originally said the Kinect sensor had its own processor, thus wouldn’t slow the system down. If you’ve got butterfingers, perhaps don’t get Sony’s new Xperia T3—which Sony claims is the world’s slimmest. It IS only 150.7 x 77 x7 mm…but it’s not water or dust resistant, so you’d better be careful with it. It’s available in black, white, or (wait for it)…purple (?). The 5.3 inch phone has a 1280×720 pixel resolution, an 8-megapixel camera, 1GB of RAM, 8GB of memory, and has a quad-core Snapdragon processor. Watch for it at the end of July. Or at least, that’s according to a report from the Japanese newspaper Nikke who has been right about releases in the past. Their report says it’ll likely have a curved OLED touchscreen and will collect health-related info including calorie consumption, sleep activity, blood glucose, and blood oxygen levels. As Apple just announced its HealthKit, which it developed with the help of the Mayo Clinic and Cleveland Clinic, AND Apple has a partnership with Nike, it sure seems like the rumor could be true. Netflix was very public this week about trying to throw Verizon under the bus for streaming quality issues with its service. It used notification screens to tell Verizon subscribers who’s to blame if their content isn’t loading (and you’ll see from the image below, it’s not Netflix). Not surprisingly, Verizon didn’t appreciate this move and has sent Netflix a cease and desist order demanding they stop with the notifications. Netflix says the message is meant to provide customers more information about their service. It’ll be interesting to see how it all pans out, but at the core of the issue is who pays for network maintenance and upgrades. The provider alone, or should the biggest user of the bandwidth have to chip in too? And now on to some geeky Friday fun…. HLN interviewed Lehtimӓki and got the scoop on his process which includes using baking powder to create a blizzard or snow (and he event talks about consulting on The Lego Movie). HLN has lots of his photos too so be sure to check it out.